© CAPCOM / VENDETTA FILM PARTNERS. ALL RIGHTS RESERVED. 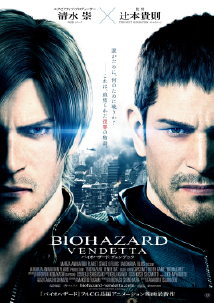 We are happy to annouce that the CGI feature movie “RESIDENT EVIL: VENDETTA” will now arrive in Japan on 27 May 2017. Also, the new trailer will be screened first at the upcoming movie Resident Evil: The Final Chapter on 23 December in Japan before any other country in the world. Advance tickets with privileges (for Japan Only) are scheduled to go on sale the same day. Please watch the latest trailers in cinemas and stay up-to-date with exclusive movie news on the official site .